Peering out from the canopy of Douglas firs thickly splayed across the Nisqually River valley near Ashford perches the Cedar Creek Treehouse, a unique one-room hotel that soars fifty feet above the forest floor. 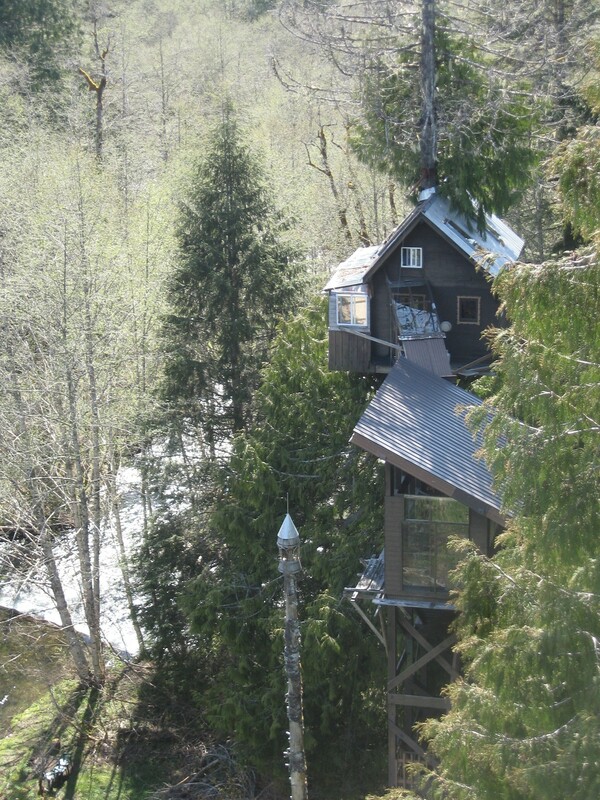 The handiwork of Bill Compher and his family, the treehouse is actually part of a complex of structures built to transport guests into the high reaches of the forest. Internationally acclaimed for its design and craftsmanship, the entire site offers a sublime vacationing experience. Treehouse and adjoining staircase tower, as seen from the nearby arboreal observation station. Originally from east Tennessee, Compher, 61, came to the land in 1976 via Corvallis, and he built the treehouse in 1981 as an abode for his wife and baby daughter while they built a traditional off-the-grid homestead on the ground. “I kind of had my Jack-in-the-Beanstalk moment one day and just started climbing the tree,” said Bill with a laugh. 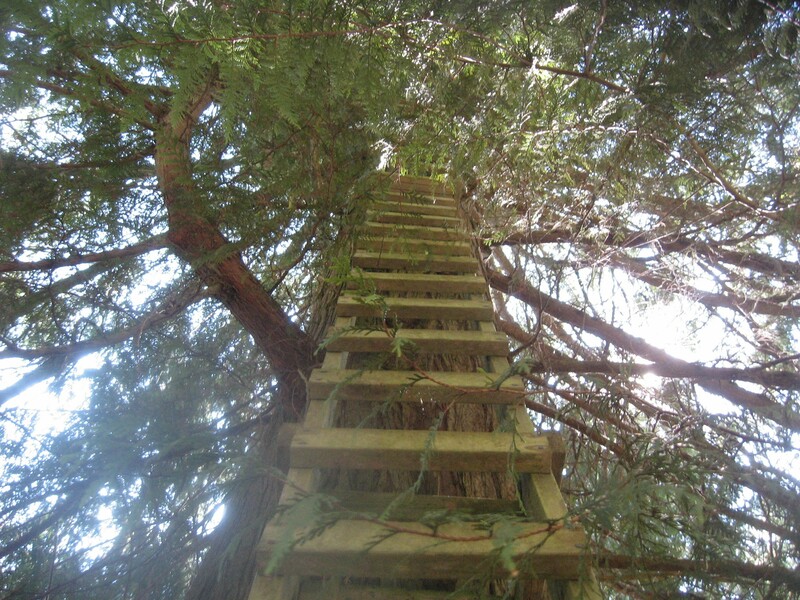 What followed was a solid ladder up the trunk of an old-growth Western Red Cedar estimated to be at least 250 years old. Fifty feet up, where the girth of the tree was still substantial, Bill first built a platform and then started constructing a beautiful tongue-and-groove cedar home. He also installed a pulley system replete with baskets to haul food and water and his six-month old daughter Amanda up into their abode. 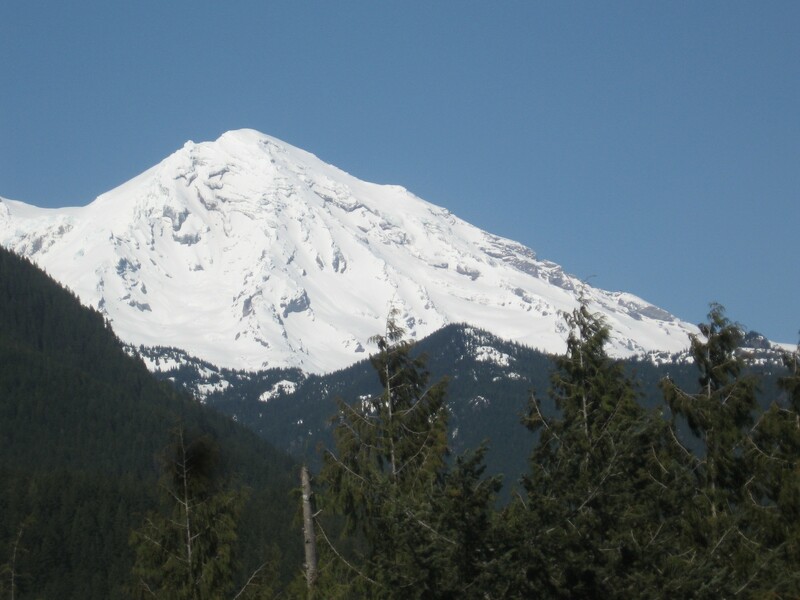 “My wife and I had to take turns – one would go up into the treehouse and pull the stuff up and the other would be down on the ground and load supplies, or make sure Amanda was safe to go up,” Bill told the Mountain News last week on a day filled with glorious sunshine. The treehouse is a sixteen-foot square with a small, enclosed porch that houses a sunroom and the toilet. “We call it a ‘loo with a view,’” Bill said with a grin. Along the interior walls of the treehouse are a small propane stove, kitchen sink and ice chest, bookcases and propane heater. 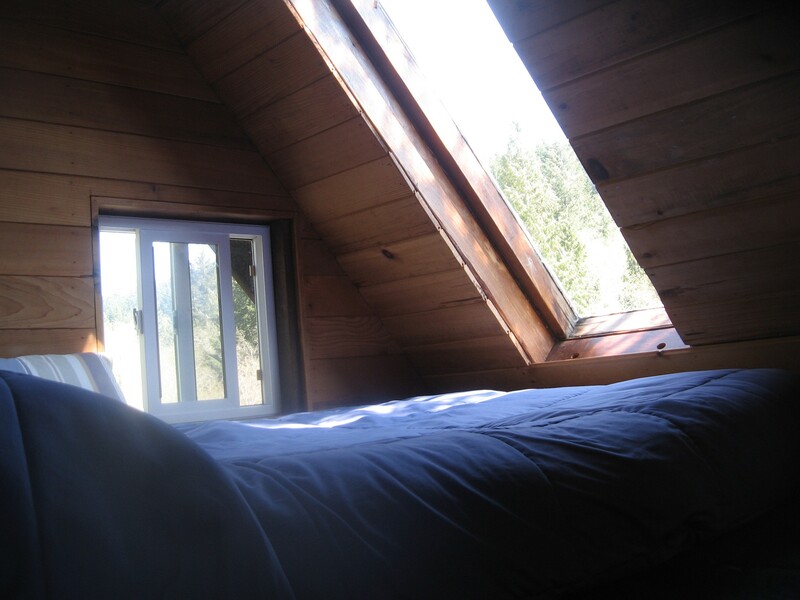 Above in a loft, are the sleeping quarters – two double-sized beds and plenty of skylights and windows. “You get a great view of the stars just lying in bed,” Bill said proudly. Great views of the skies and mountains are not the only rewards of living in the treehouse. Before long, visitors will notice that the house – despite being heavily guy-wired to neighboring trees – sways in the wind! It is not unlike being on a boat moored at a dock in a lively sea. In addition, a small photovoltaic system provides 12-volt electricity for reading and ambient lighting. After two years of living in the treehouse, however, Bill and his family moved into their new and much larger home on Terra Firma. Soon, Bill and his wife had a second child, a son whom they named “Cedar,” and not long after that Bill decided to close up the treehouse. 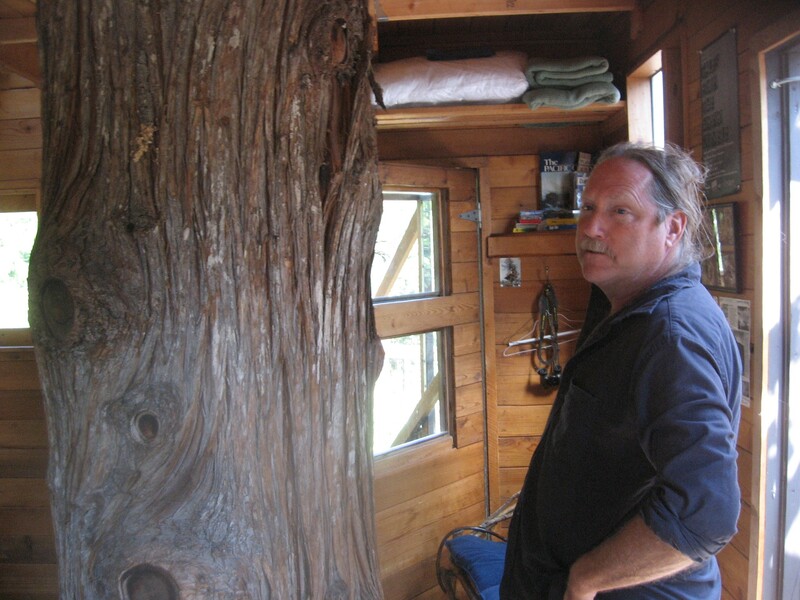 Bill Compher standing inside his treehouse and next to the cedar tree that supports it 50 feet up. For the next ten years, the treehouse remained dormant, until 1995 when Bill decided to re-open the treehouse as a hotel in the sky. 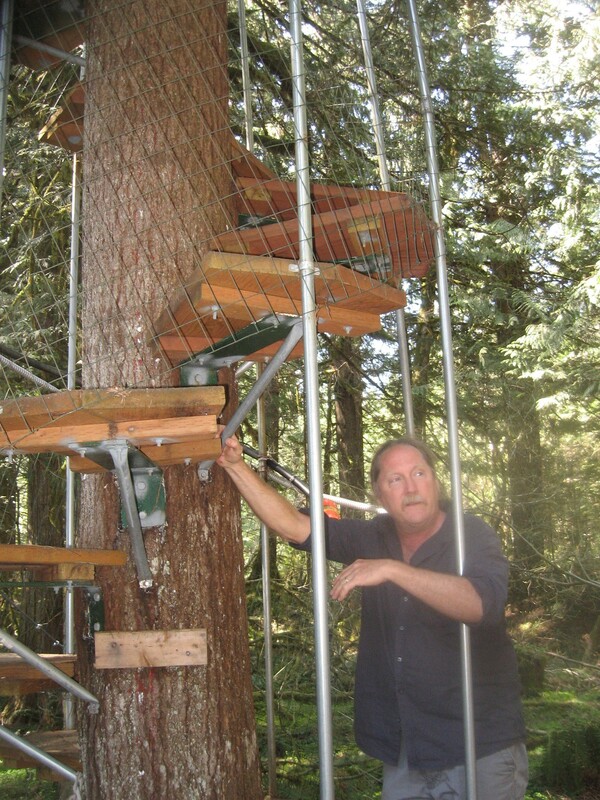 Over the next few summers, Bill built a rugged, five-story staircase that resembles a lookout tower for the Forest Service and provides easy access to the treehouse for hotel guests. The staircase also has an enclosed observation deck on its top floor that greatly adds to the comfort of guests who want to stretch and relax when the treehouse is too confining. The next structure to be built was the “Stairway to Heaven,” a spiral staircase that is unlike any other in the world. Designed by Bill and built in 2003 by his then-sixteen-year old son, the stairs wind around the trunk of a mighty Doug fir to a point eighty-two feet up in the canopy. There, one connects to two swaying metal bridges that have substantial side railings made of six-foot tall cyclone fencing and secured with half-inch cables. 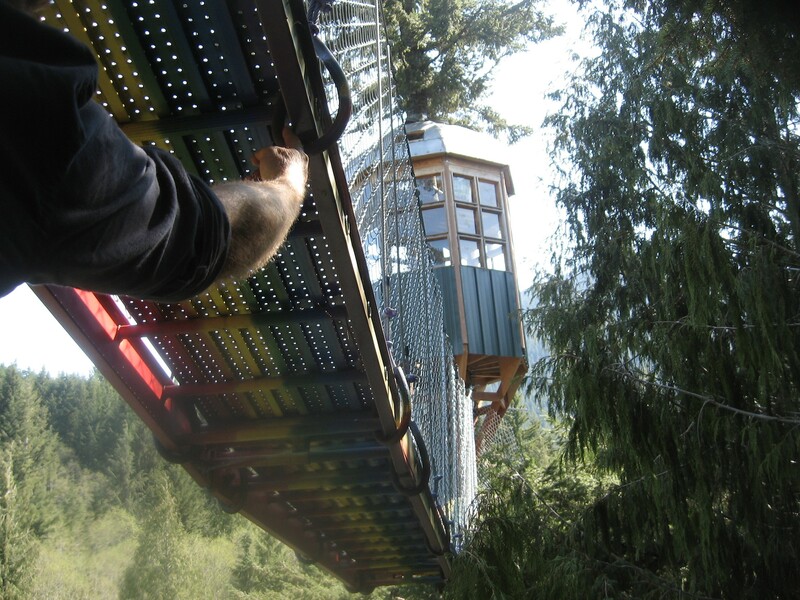 Guests are directed to take the southern one, known as the “Rainbow Bridge,” a gaily painted foot bridge that delivers folks to the octagonal “Observatory,” located on yet another Douglas fir. The Observatory was built in 2001, and is an eight-sided structure designed to shed wind, which can approach 70 mph in severe November storms. Fourteen-feet tall, the Observatory has a second story that places visitors 100 feet above the valley floor. Popping selected skylight windows from their fittings, visitors can stick their heads outside and get great views of the soaring mountains. On my visit I was able to see skiers coming down Mount Rainier on the snow fields below Camp Muir. Other guests have seen mountain goats climbing on the nearby Mount Wow and along the various slopes of the adjoining Tatoosh Mountains. Mt Rainier, as seen from the Observation tower, 100 feet up in the trees. Not surprising, Bill places binoculars and a spotting scope in the observatory for guests to use. Leaving the Observatory and crossing back over the Rainbow Bridge, visitors return to the spiral staircase junction and see the second metal bridge leading northwards. 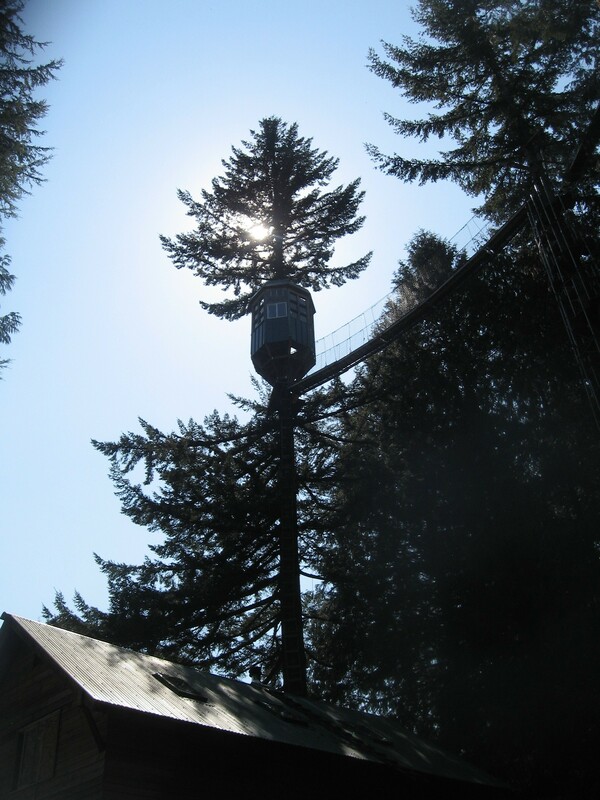 This second structure is the “Sun Bridge,” and it connects to the current construction – an ambitious project to build a large treehouse that will “float” in the air suspended by cables from five clustered cedars and Doug firs. These five trees are then in turn “back-guyed” to another five trees so that the weight of the 12 x 16 foot “Floating Treehouse” will not pull over the first line of trees. At present, all one can see of this project are five aluminum ladders placed perpendicularly to the Sun bridgework, but Bill anticipates building the Floating Treehouse this summer. “That’s going to be fun,” he said with a lilt in his voice. All these structures seem to have been built with a mix of intuition, input from arborists, and a life-time of carpentry skills learned by living freely in the woods. Bill standing next to the spiral staircase that his son built. It leads to the observation station 100 feet in the air. “I did some regular carpentry growing up,” Bill says, adding that he had a one-man remodeling business in his twenties when asked about his background. Nevertheless, the skills needed to build these structures safely are many. Not only does one need to know how to build a house, they must also have an advanced engineering knowledge of the load-bearing qualities of trees, along with a deep understanding of the biology of trees. Reflecting upon the latter, none of the trees appear to be stressed despite the many lag bolts drilled into the trunks. On my visit I did not see any disease or infestation on any tree, even on the Doug fir with the spiral staircase, which has dozens of bolts inserted to support the step bracing. “Yeah, even after thirty-five years, the treehouse is holding up pretty good,” Bill said, adding that an arborist recently inspected the tress and found them to be in good health. On the ground, a brief stroll reveals many other innovations, such as a home-made waterwheel that scoops up water from the creek and transports it to the gardens. The Observatory, back-lit by a glorious springtime sun. Ever quirky and inventive, Bill doesn’t have a conventional path to the visitors’ parking area. Instead, guests walk upon a swaying foot bridge spanning across the massive roots of old-growth trees, mini creeks and muck. Guests wishing to stay at the Cedar Creek Treehouse get a complimentary tour of the airy structures. However, folks wishing to see these wondrous works but not desiring to spend a night or two swaying in the breeze can bunk at the Cedar Loft Cabin, the family’s second hotel spot, located in Ashford and run by Bill’s wife, Sarah Scott. Nevertheless, the Cedar Loft Cabin is another splendid piece of construction by the talented Mr. Compher. For more information, contact Bill Compher and Sarah Scott at bcompher@centurytel.net, info@cedarloftcabin.com or visit www.cedarcreektreehouse.com. Also, PO Box 204 Ashford, WA 98304. 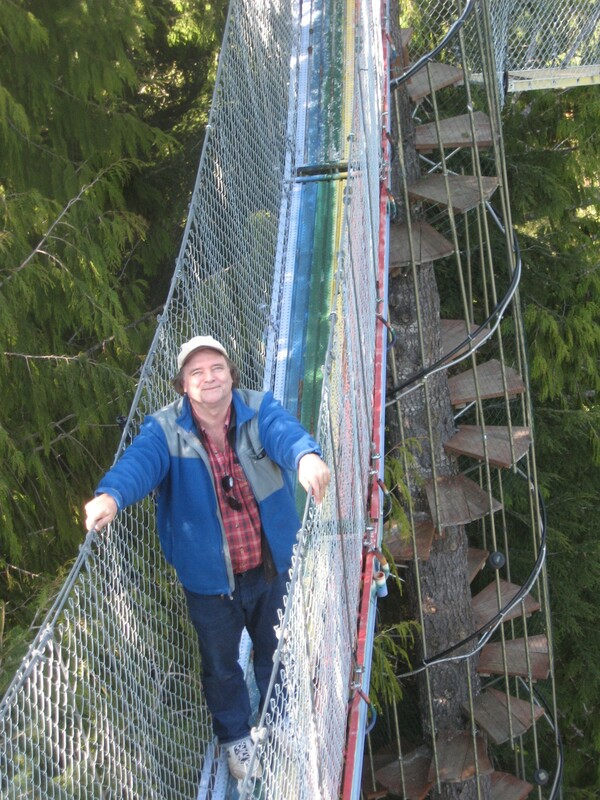 Conquering his fears, your intrepid Mountain News reporter poses for his photo op on the Rainbow Bridge, 82 feet up. For more information, click on our ad in the column to the right. Please scroll up – Thanks! This entry was posted in Culture, Eatonville News, Environment, Mount Rainier, Remarkable men and women, Self Reliance. Bookmark the permalink. A treasured memory from many years ago when, during the Bach Festival at the old Ashford House, Bill invited several participants to see their treehouse, including my wife, Barb, and I. Barb waited below while I tackled the tree ladder and pulled myself up the hatch door and into a comfortable room with most of the amenities of home, plus a big tree in the middle! They pulled the baby up, carefully, in a bucket. It was inspiring to see how much that family had added, using their own creativity and ingenuity. Thanks, Bruce, for the wonderful article.